What Does CTFU Stand for and Mean? This rare acronym is actually quite vulgar! There are a lot of online acronyms to keep track of these days, and CTFU is another one to add to the growing list. If you've been wondering what CTFU means, keep reading! You probably can already tell that those asterisks are there to of cover up the F-word in that acronym. Just like AF, WTF, BTFO, GTFO and other popular acronyms, CTFU is one that includes the F-word for added vulgarity and intensity. If you take the F-word out of the expression, you're left with "cracking up." This is an idiom used to describe the act of breaking out in extreme laughter — perhaps even to the point of crying. When someone says something funny or when you witness something funny happen right in front of you, you might unexpectedly start laughing uncontrollably. In other words, that funny person or funny event made you "crack up" with laughter. Add the F-word in there and you've got yourself an idiom in the form of an acronym that conveys added emotional intensity. The C in CTFU can mean "cracking" or simply just "crack" — similar to how the L in LOL can meaning "laughing" or just "laugh." It's a small grammatical difference, but one way might make more sense than the other when it's incorporated into an online post or a text message. "Omg, did that guy srsly just miss his mouth while eating? CTFU!" "CTFU because I just spelled my own name wrong and almost didn't realize it." "I've been ctfu over the photos u posted on Instagram last night." 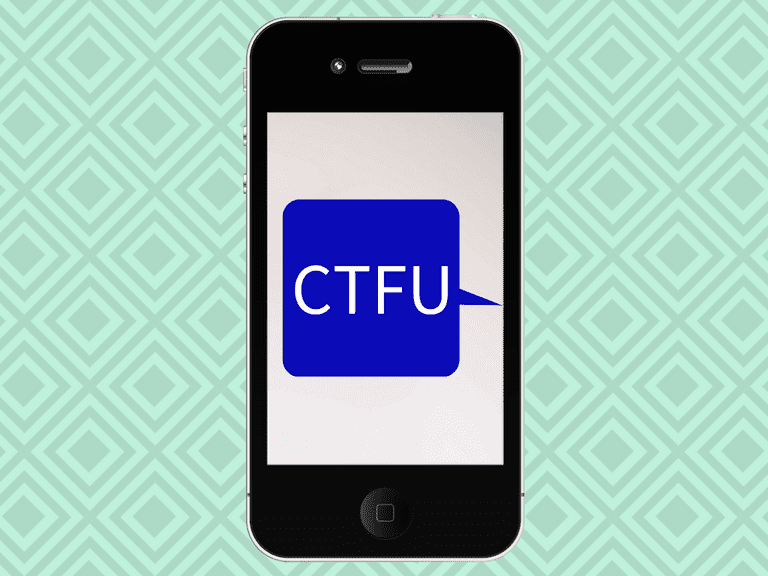 If you want to jump on the CTFU bandwagon and start using it in your own online/text vocabulary, it's important to know exactly how to use it so that it makes sense to those who see your post or message. Here are some tips. Use it when you want to express the sudden outburst of your laughter. Not all forms of laughter are made equal and CTFU is one of those acronyms that really captures that unexpected, uncontrollable outburst of laughter that everyone can relate to when something really funny happens. Use it when you want to express the intensity of your laughter. You could type "LOL" or "Hahaha," but neither one of those really conveys the intensity of your laughter when something is so hilarious that you find yourself laughing hard and uncontrollably. CTFU is the perfect acronym for adding that extra hint of intensity to your expression of laughter. Use it when you want to use something other than LOL. Believe it or not, the longstanding "laugh out loud" acronym is slowly fading out and being replaced with newer acronyms or emoji that better express a person's laughter. If you want to sound like you keep up with them times, replacing LOL with CTFU might just be the acronym that makes you sound more hip. Let's face it — it's not always appropriate to include acronyms in an online post or text message. Here are a few scenarios when CTFU just shouldn't be used. Don't use it when you don't want to offend someone by swearing. You might be fine to include swear words while casually texting one of your closest friends, but if you're emailing your grandmother or messaging a professional on LinkedIn, you're definitely not going to want to drop any F-bombs or other swear words in there. Don't use it when spelling and grammar is important. It's usually no big deal to forget checking for spelling/grammar mistakes and using acronyms/abbreviations in texts or on social media to help save time, but this is still dependent on the relationship you have with who's reading your posts or messages. For example, you probably shouldn't use CTFU in a post on a Facebook page for a company or brand that you manage. You could, however, use it if you're a teen whose Facebook network is primarily comprised of other teens. Don't use it when the person/people who see your post/message don't often use acronyms themselves. The fun of using online acronyms can be ruined when the people who read your posts or messages have no idea what you mean and have to ask you what CTFU stands for. If you already know that the people you're communicating with online or by text just won't get what CTFU means, you may be better off not using it.